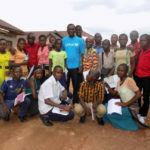 When Isiro celebrates the rights of the child ! 17 January 2018 No Comments on When Isiro celebrates the rights of the child ! 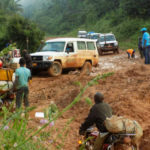 CHILD REPORTER – The celebration of the 20th November was the first in the city of Isiro and in the Haut-Uélé province and…. the mobilization was complete! YOUNG REPORTER – UNICEF organised an art competition for artists of the Academy of Fine Arts, on the occasion of its 70th anniversary. 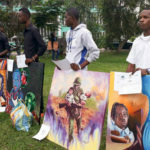 The competition aimed to depict children’s rights in the DRC in works of art. 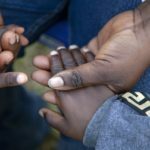 How can children come to forget the extreme hardships they experienced in armed groups and forces? 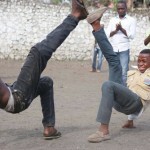 One successful method is capoeira, e sport that originated in Brazil hat combines disciplane, strength and dance. Thank you, Brazil, for you precious support in this project! 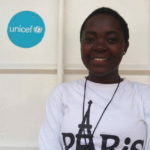 Meet Laetitia, one of UNICEF’s young reporters! 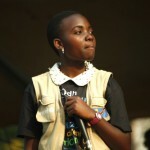 She covered events such as concerts and seminars that were organised to raise awareness of child marriage among Goma’s population. She tells us about how successfully the celebrations went. Bring a little bit of happiness into your day ! 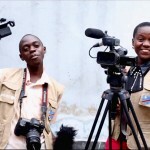 Discover or rediscover “Happy” worldwide hit, sung by the youth from Goma. 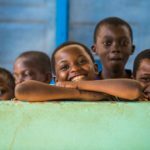 They want to tell the world that peace is possible in Kivu.